The idea of a checksheet vs. carts makes sense. Dim sum is traditionally prepared in bulk and can be anywhere from one minute to one hour before it’s eventually placed on a custome’rs table. For those small plates that arrives by cart, the dim sum rely on the steam of the carts to keep it warm whereas a check sheet allows the dim sum to be made/cooked/reheated to order. The check sheet method is all well and good, makes business sense, and I know my mom prefers it. Despite the prospect of somewhat fresher dim sum, I prefer dim sum that comes via pushcarts. To me, it’s a defining factor of the overall experience. It’s what I grew up with and dim sum just isn’t as enjoyable without pushy women pushing pushcarts. Not just that, I like that the carts are like bumper cars attacking your table as soon as you sit down (normally after a long wait). If you want the dim sum pushcart experience, here’s a list of Chinese restaurants that use pushcarts to serve their dim sum in New York City — mostly in Manhattan’s Chinatown, but there’s a few from Brooklyn and Flushing. The “dim sum with carts” list was compiled with the help of Yelp and experience. I can personally confirm that six of the above restaurants use pushcarts to deliver their dim sum. What I can’t confirm is even one restaurant that has made the change from carts to check sheets and there are a few important reasons why Chinese restaurants won’t move away from pushcarts. As with MSG, carts are a staple of the dim sum experience. On top of that, the most-popular restaurants are packed almost seven days a week. 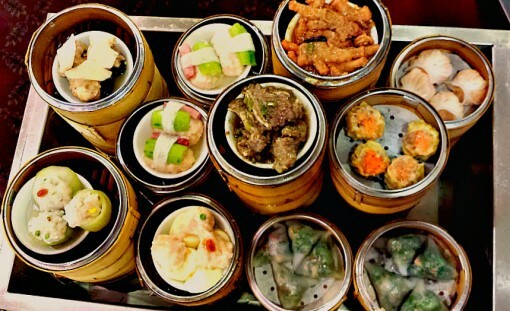 So even with pushcarts, the turnover is so high that the kitchen has to crank out plate after plate of dim sum to meet the demand — especially the more popular dishes. With these restaurants, not only do you get dim sum that’s fresh and hot, but you get it delivered to your table with pushcarts.